Yes, that’s right – volume 8! 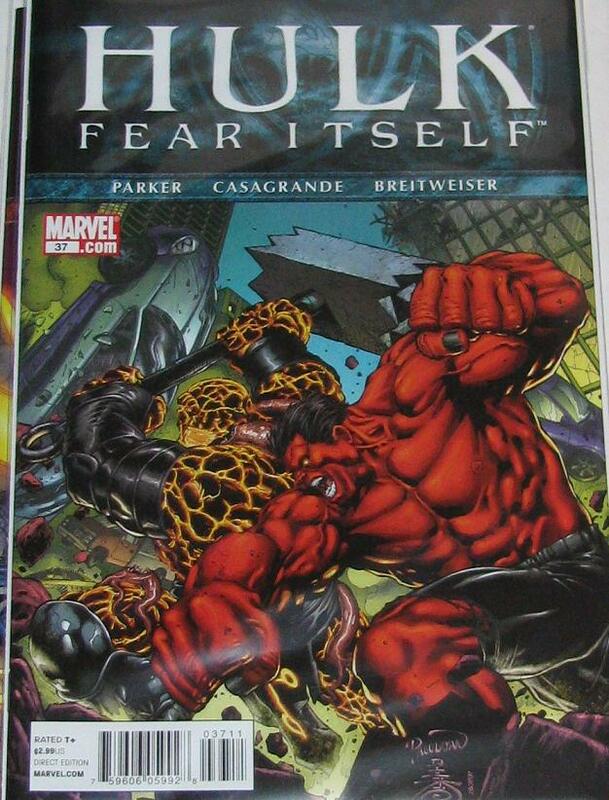 While I applaud Marvel for continuing this series going I do have to give a strong jeers to the fact that they are charging $29.99 – and have even stopped using the glossy paper stock. Maybe they didn’t think anyone would notice – or more like; they don’t care. 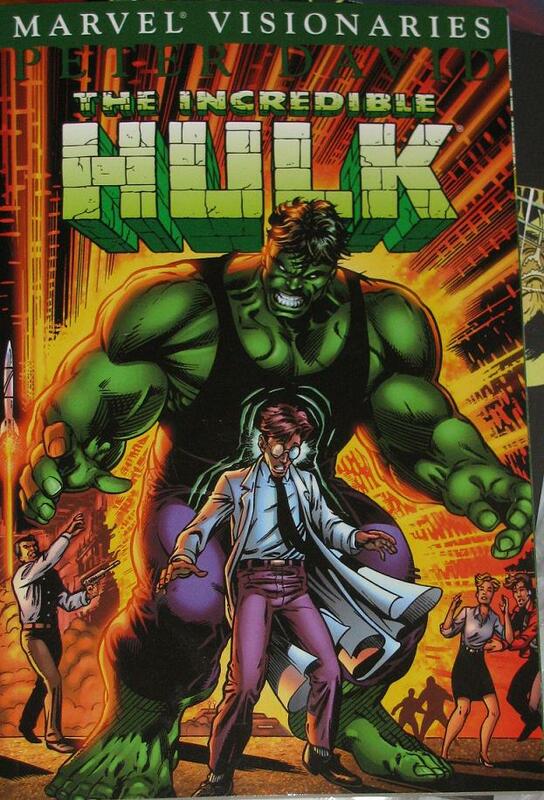 Still, I would love to see a collected Omnibus of the Hulk PD years – just as they did with the ASM McFarlane years. Parker continues to shine as the Hulk title keeps going strong! 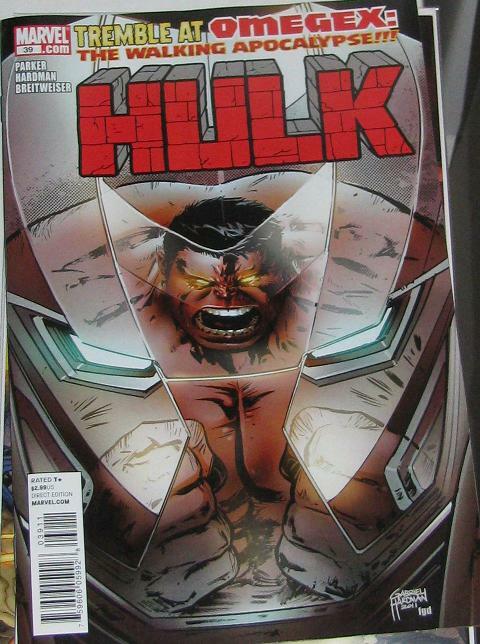 Unlike TIHs which is striking a hic-up among some strong Hulk fans; Parker’s storyline , as it comes together, continues to be engaging and wildly entertaining! 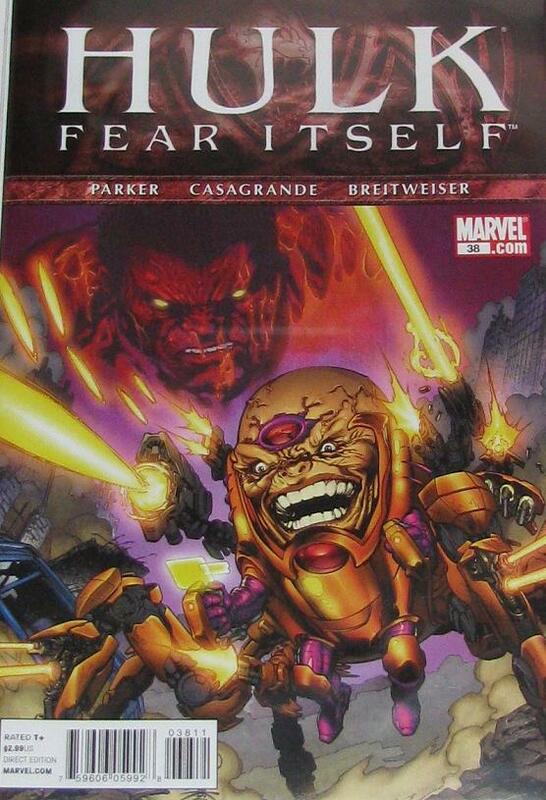 The last we knew MODOK 2.0, and Zero/One’s assassin Black Fog both took a swipe at taking out Red – but starting with issue #37 Parker is asked to tie “Fear Itself” or as most are calling it “ZZZZZZZZZ Huh? Wha..? Is Marvel still doing big events that no one cares about? Oh – awesome” but we’ll call it “Fear Itself” for short. So, the worthy Thing and Red battle – but the Thing… Ah – Angrir topples the Avengers tower onto Red – leaving him vulnerable. Black Fog goes in for the kill – but MODOK 2.0 is like “Uh-uh – that’s mine!” and attacks him. The old logical MODOK would have realized that if someone want to kill one of his enemies, well, that’s less work for him – but the new MODOK wants the kill – he wants to be the one who does it, to revel in his kill. Sure enough, Black Fog does not take too kindly to MODOK’s advances and goes to kill him – but Zero/One stops him. She wants Red killed and figures that keeping someone alive who also wants Red dead will only help the cause. At this time Red gets taken out of the equation by being hit by the Thing and being knocked 15 miles away! Meanwhile MODOK and Zero/One combine forces to take out the Serpent’s army in order to keep them from taking over Manhattan. But as Red returns to his childhood home and remembers his Mom and tries to stop crying like a little girl he also runs into the Omegex. Cue dramatic music! When I saw this set I was pretty excited. 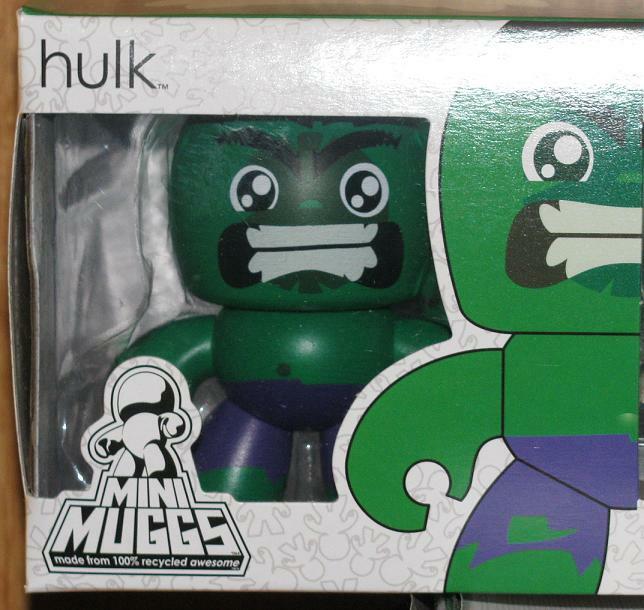 We haven’t seen anything new from Mighty Muggs in the respect to Hulk for a long, long time. The line seems pretty dead except for exclusives – haven’t heard of a wave 7. Maybe I am wrong (it’s happened before) but I don’t think we will see a wave 7. Upon further inspection of this set I noticed that all of the Muggs are the mini ones – other than Giant Man – who really makes this set poking his head out of the top of the box! New Marvel vs. Capcom Minimates! Toys R Us will be getting the Capcom vs Marvel Hulk vs. Mike Haggar in Ocotber – so keep an eye out… just saying. I know this is somewhat old news – but who cares? 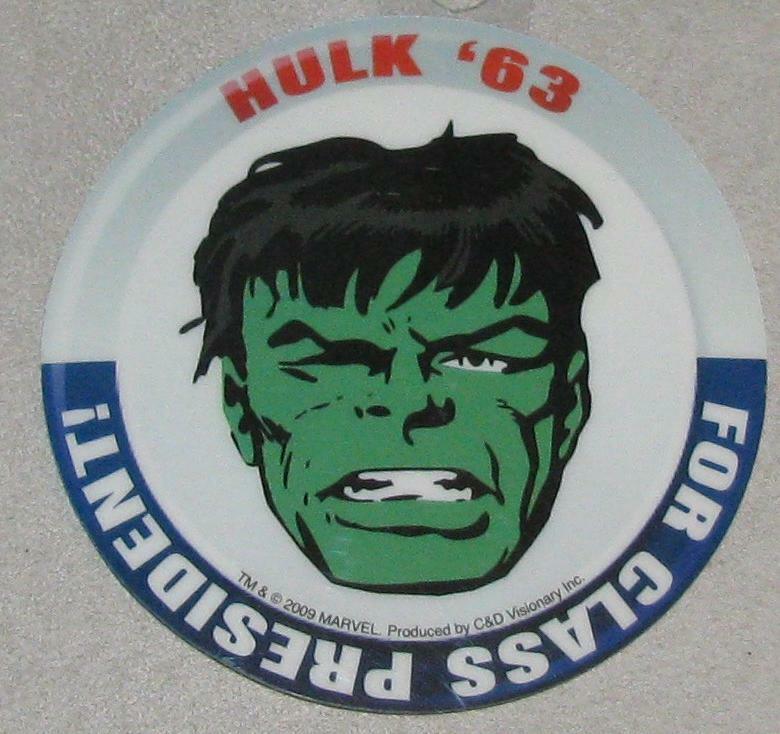 I picked up a few more stickers – one of which will be replacing the window cling on my car right now – and because it’s just that cool – the Hulk for Class President – ’63, it’s classic enough but it looks like the pins of yesteryear that canidates were handing out. 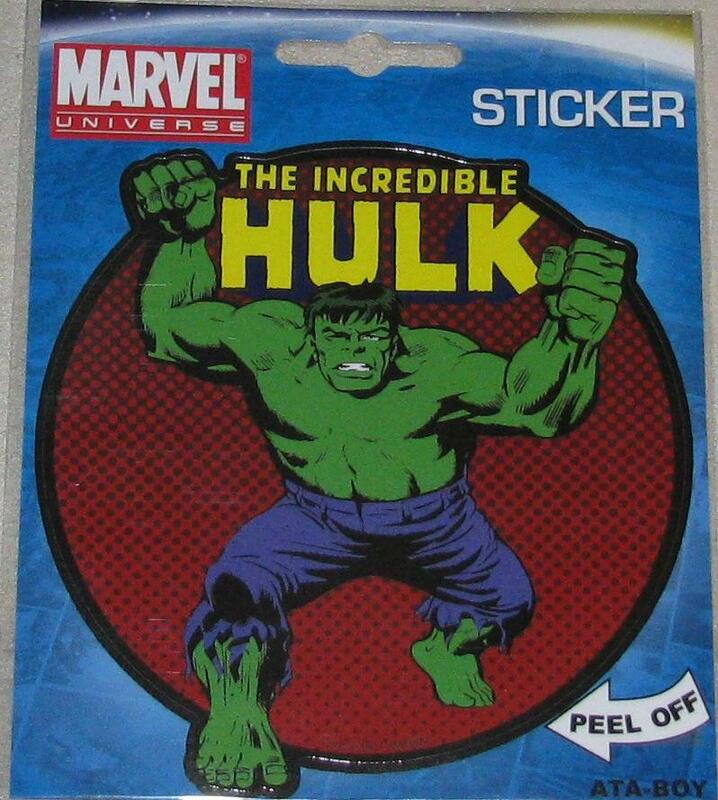 The other sticker I’ve seen everywhere and it’s a full body shot of the image that they’ve used the head from. 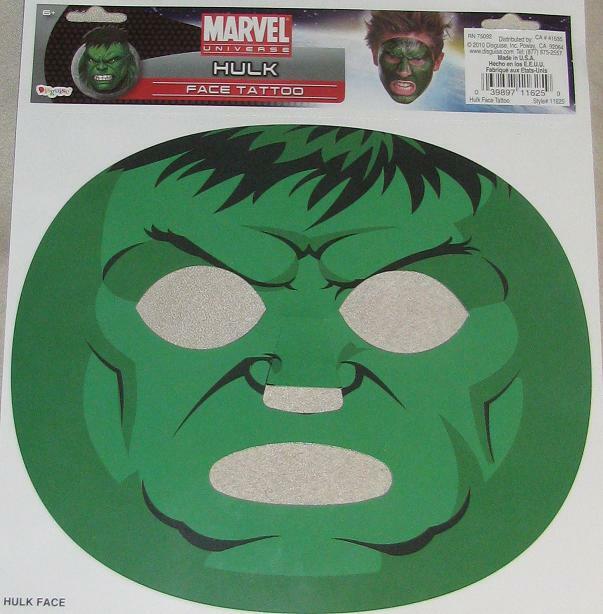 Hulk face tattoo - it's okay to admit you want one! 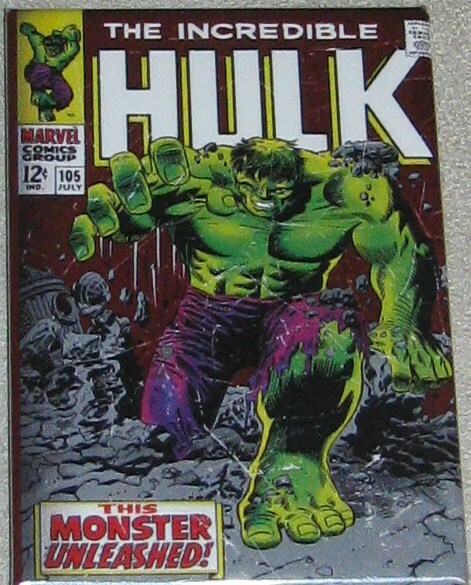 I am really trying to concentrate my collecting – not picking up anymore backpacks and lunch boxes that I will not use – and instead looking more to the items I want to display – and trust me when I tell you I agonized over this purchase – only because it’s one of the most unique and hilarious Hulk items I have ever seen! A face tattoo!??! Not only do I want to wear it – and I am not talking about wearing it on Halloween – I am talking on a random Tuesday while I go to dinner – but I want to find another for Lex so bad! So, yeah – be jealous! Be VERY jealous! DPS Robot Hulk beating down Nova! Alright, let me just say I have not forgotten or abandoned you guys! I have a ton of stuff to still post I just have to find the time! So, that brings us to this – while I would like to delve into the original art with both feet – but the unfortunate part of being into any collectibles market is the rise and fall of prices and values. Right now OA is on the rise – and splash pages are an easy grand. Luckily, this Double Page Splash was not anywhere near that! Beautiful mug! 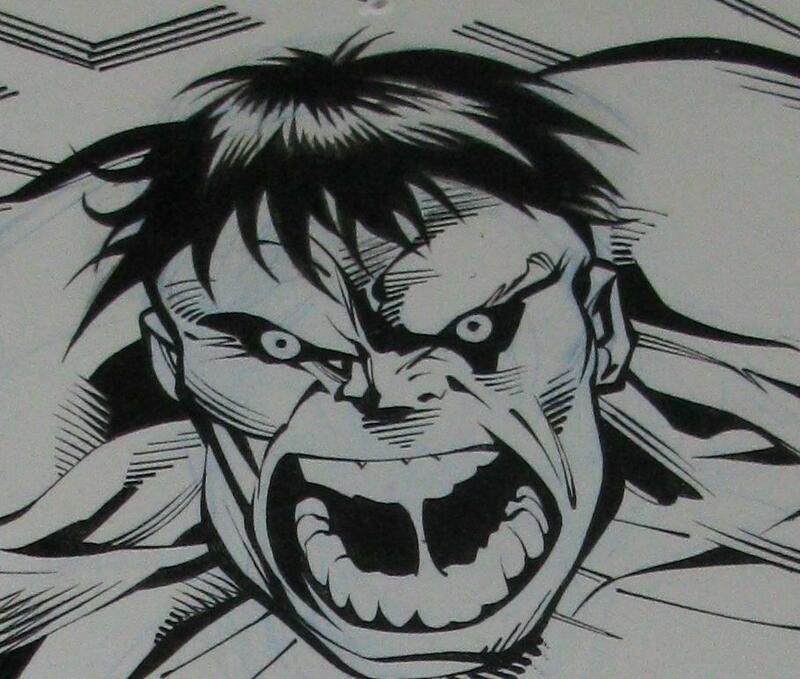 Love the rage in the face! 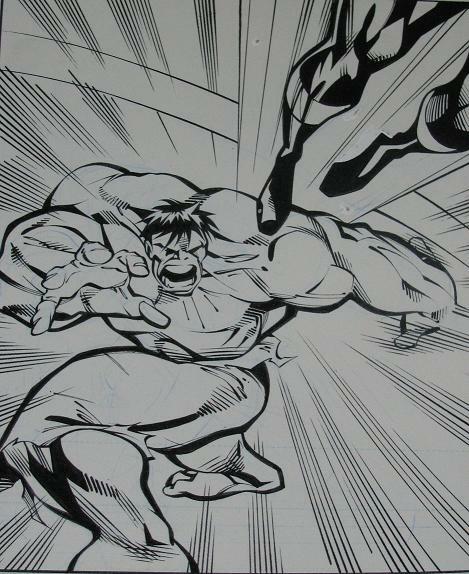 There are a few reasons that this page was considerably less – in fact, the biggest reason is – this isn’t actually the Hulk. It’s a robot. 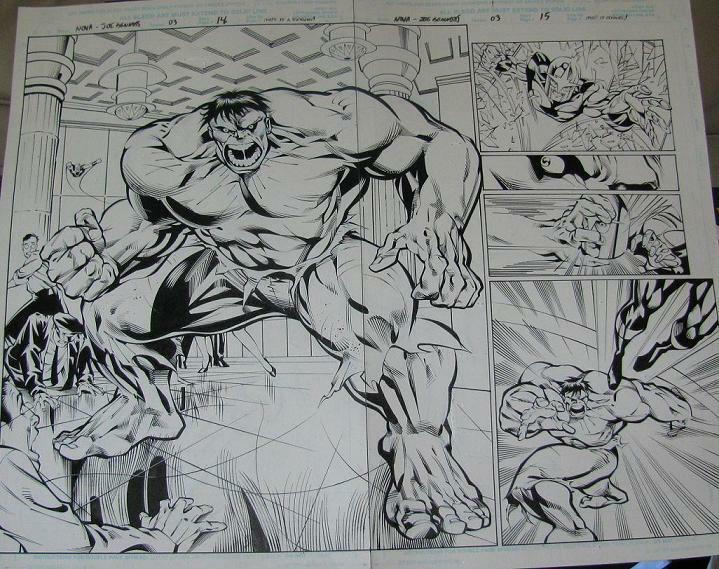 That doesn’t change the fact that it’s an incredible Hulk drawn by Joe Bennet and that is a double page splash. Another reason is that it comes from a short lived series – Nova, volume 2 – which, if you ask around, was a pretty good series. That seems to happen with the best of them – the best series don’t really last all that long. Too bad.